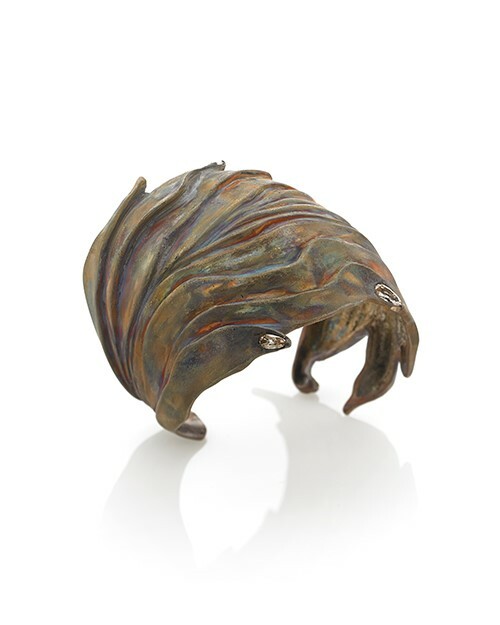 CARLSBAD, Calif. – GIA’s museum in Carlsbad, CA will celebrate 25 years of jewelry design with a finely curated selection of nearly 200 works of jewelry and objet d’art by 40 members of the American Jewelry Design Council (AJDC) beginning July 29. “Variations on a Theme: 25 Years of Design from the AJDC” is a dramatic, thought-provoking and entertaining display that challenges and inspires visitors to consider thematic elements expressed in design. The exhibition will be on view through June 2016. “Variations on a Theme” is a traveling exhibition of nearly 200 pieces created by 40 AJDC designers as part of an annual project started in 1996. Each year the one- or two-word themes – such as water, puzzle, tear and flight – offer designers the opportunity to interpret meaning from their individual perspective. The result is an array of designs with a common thread, each distinctly expressive of its designer, that elevates American jewelry designs as works of art sought by collectors and museums. The AJDC is a nonprofit education group formed in 1988 to promote American jewelry design and is dedicated to raising awareness about the aesthetic value of artistic fine jewelry. This exhibit, which celebrates 25 years of AJDC, debuted in September 2013 at the Forbes Galleries in New York, followed by an exhibit at Kent State University in Ohio. “Variations on a Theme” will be on display in Carlsbad from July 29 through June 2016. The Institute’s museum is free and open to the public Monday through Friday during regular business hours.